The history from the Echo 4 to the Echo now. 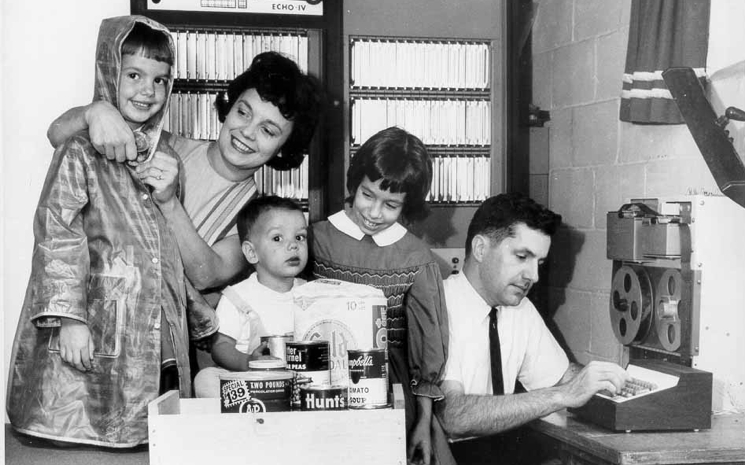 Home automation has been on the market for a long, long time. The first home automation system was created by James Sutherland. He called it the Electronic Computing Home Operator 4 in other words, Echo. Now if you are familiar with the Alexa devices, you know why they called the device the Echo! Recently a device came on the market that is selling extremely well, namely the smart speaker. And yes, it’s the perfect time for a device like this! Subscription models on music, in other words, Spotify and iTunes, have been accepted by many (191 million Spotify users). These services use the internet. Hence, internet-connected speakers is a logical next step. Siri and Google Now, originally developed for smartphones, now allow you to switch tracks or change volume while cooking or just sitting on the couch. To understand how rapid these devices got adopted, the following graph speaks for itself. If you’re living in Europe, the offering of this type of technology is slower, but it just lags. The different languages are hurdles for the technology. However, these are just minor bumps. If you understand Dutch, check the last talk at this Tweakers meetup to see how - for a different language - only a small part of a deep neural net needs to be retrained. Case in point, Google Home is now available in the Netherlands. 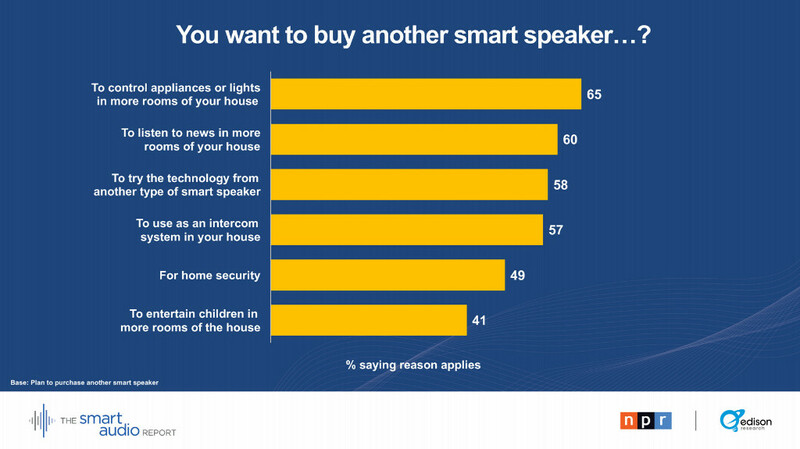 What do people use smart speakers for? And most important. What do they want next? The smart audio report from National Public Media gives us insight. Not only do people control home appliances with smart speakers. The main reason to want to have more speakers is to control appliances or lights! Smart speakers are a key enabling technology for smart homes. The trend for increased interest in the latter is unmistakable. There are now smart lights, smart thermostats, and smart security systems. We use smartphones in our daily life to stay in touch with family and friends, have a camera in our pocket, read the news, listen to music. Likewise we will have smart homes in our daily life to never enter a dark or cold home (or room! ), not to worry about energy waste, and feel protected at all times. Amazon is one of the key players in smart speakers. Alexa fits its business model like a glove. Customer contact without relying on a search engine or someone else’s app store. Crownstone’s indoor positioning tech is a perfect add-on to voice tech (or from our perspective: it’s of course the other way around). Now, if your Alexa is configured for the UK you’re in luck! We enabled the Alexa skill for our English-speaking customers in Europe. You can help us as well! We need German, French, and Spanish text translations and the skill will also become available in those countries. The open-source code (and the text to be translated) can be found at Github. The Crownstone Alexa skill allows our UK customers (or if you’re Alexa’s location is set to the UK) to control the Crownstones with voice. 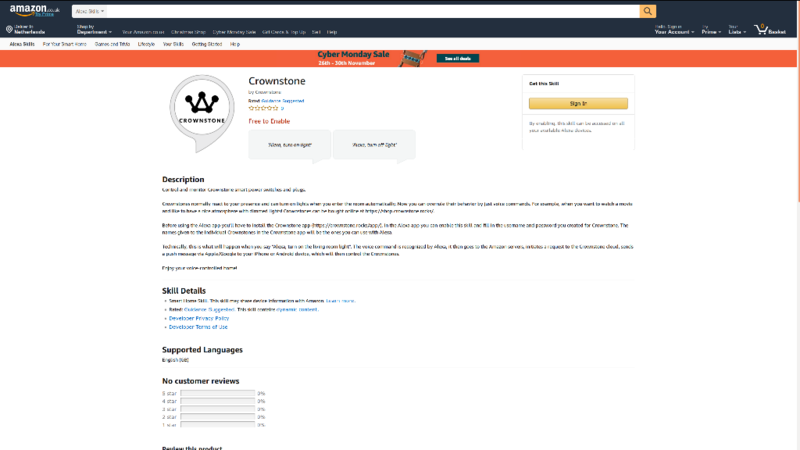 Head over to the Amazon site to enable the Crownstone skill if you like to use your voice to control your lights! Good news on the privacy front! Apple allows you to download a copy of all your data from their privacy portal. Very nice. At Crownstone we go one step further and allow you to delete any data through the REST API at https://my.crownstone.rocks. Crownstone wants to “be out of the way”, not the type of technology that makes you addictive. At Loup Ventures they wrote an insightful article about how to combat tech addiction. We talked before about passive tracking by measuring disturbances on the 2.4 GHz spectrum (used by Wifi and Bluetooth). Researchers at the university of California used ordinary smartphones to track people (medium post). With this tech, Crownstones can be made into a burglar detection system. Sad news about lonely people. Half of them think no one will notice if something happens to them. This does strengthen our view that smart homes are not just about being “smart”. Artificial intelligence in our homes means that our home pays attention to us, communicates for us, addresses our actual needs! A proposed bill to forbid humans to use virtual bots in telemarketing where the artificial nature of the bot is not being revealed. Interesting! The same law for humans would be the following: It is forbidden to sell something without telling the customer that you are a human. It sounds like discrimination against AIs. If you’re curious what our smart home tech might mean for you, contact us! In January we will be in the United States, Las Vegas at CES 2019. Add us to your schedule for a demo with super cool new functions! Also, drop Anne a message if you’re in the Bay Area. In March we will be at Jaarbeurs Utecht, the Netherlands at Beurs Eigen Huis. And, for any question Slack us!